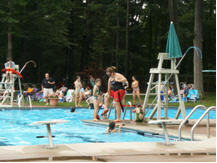 Open Swim – See Hours of Operation for a schedule of open swim times. Guests fees for non-members is $5.00 per visit. The same guests are not allowed more than 3 times per month. Lessons, Teams and other organized aquatic classes are held during weekdays and are included in certain memberships. Please see the Membership - What's Included Page for more information. Dive Lessons – Diving Lessons are offered for beginners through advanced. Synchronized Swimming – Synchronized swimming instruction is offered to boys and girls up through age 18. Swimmers work on routines with instructors and perform at the end of season team banquet. Swim Team – The Glenbrooke Gators Swim Team is open to all members age 6 to 18. Prior swim team experience is not required. Dive Team – The Glenbrooke Dive Team is open to members who have achieved a diving proficiency as determined by the dive coach. Prior dive team experience is not required. Adult Aquatics – For adults, Glenbrooke offers water aerobics, swimming lessons (if there is enough interest), water polo, adult only swim 15 minutes during every open swim and one lane for lap swimming at all times during open swim. Water Polo – All members over the age of 12 are invited to play on Friday Evenings at 7:00pm and Sunday mornings at 10:30am. No prior experience required.